While trying to decide on my next topic, I saw that “how to be friends with an INFJ” was one of the top searches on my blog this past week. I’ve addressed the issue of friendship in some of my other posts about INFJs, but never written an entire post about it. It’s also something that has been on my mind recently, and it is a not infrequent topic of discussion between me and some close friends. If you want to make friends with an INFJ, or get to know one better, there are a few key points to keep in mind. Some of these are true for all friendships, and especially friendships with INFJs, and others are more INF-specific. They are also a good first-step if you are romantically interested in an INFJ and want them to notice you. 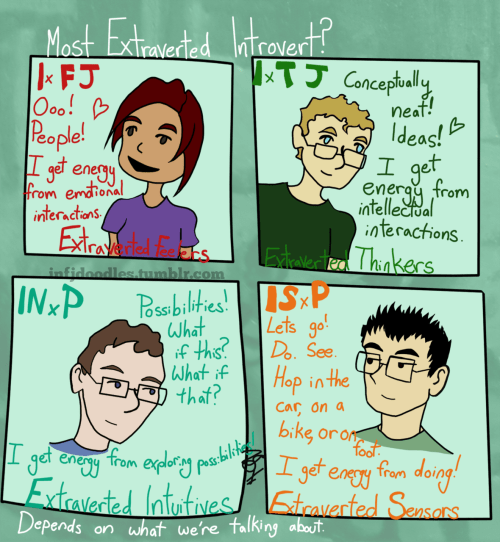 INFJs use extroverted feeling (Fe) to relate to the outside world. This means that we can draw energy from emotional interactions, and may appear more extroverted than other introverts. This is also true of ISFJs, who are often considered the most “extroverted” introverts since they love people so much. Still, we are introverts, and we’re most comfortable talking with people we already know. If you want to get to know an INFJ, you’ll probably have to be the one who initiates a conversation. That lets us know you are interested in talking with us, which puts us at ease since we aren’t worried about whether or not we’re imposing on your time when you’d rather be doing something else. Pairing Introverted Intuition (Ni) with Fe gives INFJs an almost super-human empathy. Many INFJs literally feel other people’s emotions, and we’re quick to pick up on unspoken cues that don’t match spoken words. We might not be able to tell what you’re holding back or lying about, but we can tell you’re not being genuine and that’s a huge turn off. If an INFJ suspects you of being less than genuine, they loose interest very quickly. If you’re a new acquaintance, they might simply avoid seeing you again. If you’re someone they can’t avoid, then they will keep conversations civil but superficial. We don’t trust our true selves with people when we can’t get a read on what their true selves are like. Even if you’ve taken the first step to initiate a friendship, been completely honest, and encouraged deep conversation it can take quite a while for an INFJ to really open up. We have many layers, and the longer we are in a stable friendship with you, the more layers we’ll let you see. INFJs form instant perceptions of whether or not we can trust people, so first-impressions are important, but we also modify our impression based on how we observe your behavior over time. A bad first impression can be reversed if we see you making an effort to be friendly and trust-worthy, and a good first impression can be deepened as we see that what we’ve already shared with you stays safe. Patience also comes into play during conversations. INFJs have trouble getting all their thoughts out into words. If the topic of conversation is something they’ve already thought about, they can speak readily and coherently. If it’s new and unfamiliar we typically do one of two things: 1) nod and make some general comments while our brains frantically race to come up with something to say. Usually that “something” shows up a week later in the shower. 2) start putting our thoughts into words, and sorting through ideas verbally. The final idea might take some time to emerge. The second reaction is the one you’re going for in a friendship with INFJs. If we’re comfortable enough to think out-loud, it means we trust you. As long as you give us time to come up with an answer rather than look at us like we’re crazy, then we’ll relax and the conversation can continue to move forward. If you cut us off or jump to conclusions about what we think before we’ve had time to express outselves, we feel like you aren’t really interested in what we’re thinking and be hesitant to share with you later. INFJs hold grudges. We might forgive readily (depending on the circumstances), but we don’t forget. It’s not something I’m proud of, but it is my automatic response. The closer you get to an INFJ, the harder it is to bounce-back to a close friendship after you’ve hurt us. The more we like you and the more we have invested in you, the more chances we’ll give you, but there’s a point at which we just give up and shut you out. An INFJ might not completely sever ties with someone who has hurt them (depending on the nature of that betrayal), but they will withdraw. For example, if you give an INFJ the impression that you want to carry on a regular correspondence filled with deep discussion and then ignore her for 3 months and forget to answer any of her questions when you do reply, she will have no interest in continuing the correspondence. So why go to all this effort? What do you get out of a relationship with an INFJ? For one thing, INFJs are surprisingly good fun to be around. We have a great sense of humor, delight in occasional spontaneity, and can talk about pretty much anything you like. But you don’t see all that until you make the effort to become friends. Until then, INFJs will hover in the background (away from other people) or blend in like a chameleon (with other people) to avoid stressful, superficial interactions. INFJs are also good listeners, and we love to offer counsel. Sometimes we feel like our friends’ therapist, but we rarely mind. We want to help, and we’re good at suspending judgement. Since we’re so empathic, we aren’t often surprised by anything you tell us even if you thought you were doing a good job of keeping it hidden. Once it’s out in the open, we are sympathetic listeners who ask questions and want to fully understand what’s going on before we offer suggestions or any kind of judgements. We’re also fiercely loyal. We don’t let many people get close, and we want to hold on to the very few that do become our true friends. We’ll do just about anything to keep the people we love in our lives. INFJs take the time to build-up their relationships, cultivate deepening friendships, and keep in touch with what’s going on in the lives of people we care about. We’re supportive, encouraging, and willing to adapt ourselves to make others happy as long as it doesn’t conflict with our core values. So get out there and start making friendships with INFJs. I don’t think you’ll regret it! This is right on. I always that that I could not come up with the correct words to say in about a subject that was new to me because I had a supposed learning disability and that I was just “slow”. I guess I don’t and it is actually just my part personality. One other thing that I find, is that If I talk about my thoughts, feelings, and sometimes, regrettable actions out loud, a lot of extroverts will say, “Don’t worry about it. You are doing just fine.” This makes me feel slighted. I am not talking about my feelings and actions because I want pity. I am talking about them because I want them analyzed so that I can figure out why I did the action in the first place. I’ve talked with several INFJs who thought or were told there was “something wrong” with them (learning disability, antisocial, or too sensitive, for example), and later found out that whatever it was is perfectly normal for an INFJ personality type. 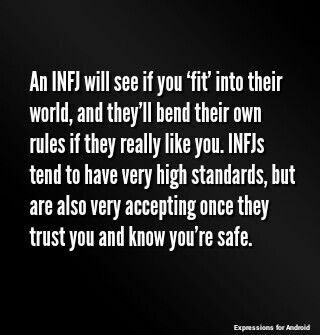 That seems to be something most INFJs deal with to a certain extent, just because the personality type is so rare. It is irritating to have people assume you want pity when what you really want is conversation. I find some people assume talking about your thoughts, feelings etc. was the goal of the conversation, when I often just see that as background information I’m sharing before launching into a real discussion. I should add that is unless we know that they are really interested in hearing our truthful answer and we trust them enough yo give it. I feel the same way about my bf, he makes me feel stupid when I am trying to tell him something, because he is insisting on a quick answer, which is hard. He says “can’t you make a complete sentence?” At that moment, I am deeply hurt and say nothing. I’m glad you liked it 🙂 and thanks for commenting — I love hearing from my readers! I also like to learn about people, and feel good when they are happy. It is an accomplishment of sorts to use your INFJ gifts of observation to make sure other people are enjoying themselves. I find that one of the most fulfilling ways to stay happy and inspired as an INFJ is to project happiness and inspiration into the people around you. You will, in turn, reflect those feelings back into yourself. We control the flow of energy so we have (almost) all the power. Love the article! Great observation 🙂 thanks for your comment! I would be extremely interested in such a guide to INFJs. I have three or four close friends (and a boyfriend) that happen to be INFJs and as an ISFJ/ISFP I appreciate any help I can get in knowing how best to present what I have to say in ways that are helpful and not confusing (I find the S in me struggles to identify with the N in them). I want to love my friends and boyfriend well and understanding where they’re coming from and how they think is important. Thanks for all your articles! They have been a great help. I’m glad you’re finding my articles so helpful 🙂 One of the reasons I love Myers-Briggs so much is that it helps me understand other people better. I have some good friends and family members who are Sensing types, and I’ve found articles about their types helpful in understanding them (I think the trouble communicating between S and N types goes both ways). I loved this blog post. I’m an INFJ and sometimes it feels wonderful to be so different…but at the same time it feels a bit lonely. I’ve totally experienced those moments where people think that they understand me and in my head I’m like…no you don’t understand me at all! But it’s not their fault. INFJs are a bit complicated to understand because as you explained in your blog post…there are layers and layers. To get to the innermost layer is very difficult. I agree with the grudges part as well…if a person hurts us, we’ll forgive them but we’ll never forget and eventually it might reach to a point when we completely shut that person out of our life. I’m happy that there are others like me in the world. Sometimes I really feel alienated. I really liked this post. Most of it was really true, in fact very much true. Especially the misunderstanding part, I feel very understood when people try to guide me and actually I don’t have any plan or desire to go for. I recently came to know about my MBTI, and I’ve asked my friends to give test, none of them are idiolist, can only see SJ so far.Read all of them.. I wish I could tell my friends to go through this post. Does other types have feelings hidden layer by layer? Because nothing is mention about others feelings this way. I wish I could have an INFJ friend. Hope it’ll in understanding. I know other types will hide their feelings and open up gradually, but I think INFJs are the only ones I’ve seen described as having this many layers. INTJs, for example, often appear unemotional but when they do decide to share what they are thinking and feeling they are fairly straight-forward. ENFPs like to keep their emotions hidden, so they do have “layers” in the sense that they can make you think one thing about them when something else is going on inside. But INFJs open up in many different stages as you get closer to them, which is something most other types don’t do. Most of my INFJ friends are people I met online. It is nice to have other people to talk with who understand what it’s like to think this way. If you’re on Facebook, you might try the groups “Introvert, Dear” and “INFJs are Awesome” to meet other INFJs. SJ types can also be great friends — my best friend is an ESFJ and we get along wonderfully. Thank you for considering my comment and I am really grateful that you paid head to it and answered. I skimmed through your artwork @ Marissa Media. It is really interesting to know that you have such hobbies like painting, cooking and maintaining blog, even answering them. I hope I’ll meet INFJ on Facebook with whom I can have words and experience. SJ types really make good friends, especially SFJ, only those I found quite close, while ISFJ the closest. In fact I share my thought in depth with one ISFJ but there are still many black holes for him even being such good friends for 5 years. Thanks again for helping me to find a way. Just as a doubt I can really have one to one conversation with one of them? Most of the interactions on the Facebook groups are conversations that take place in posts. The groups are private, so only other group members will see what you share. I know some people have become friends through the groups, and keep in touch one-on-one, but you start out interacting with the whole community. If you notice an introvert using Fe, then they’re most likely either an INFJ or an ISFJ. And you can usually learn whether they’re a Sensing type or an Intuitive type by talking with them (keeping in mind that it takes a while for INFJs to open up). Alternately, you could just ask. I like to bring up psychology and personality types when I’m meeting new people and we’re discussing interests and hobbies. Then you can ask, “Do you know what your Myers-Briggs type is?” Many people don’t know, but there are quite a few who’ve taken the test. Hi, I really liked this post, thanks. Whatever you decide, thank you for your own blog !! I’m honored that you would want to include my post on your blog and help it reach the francophone community. Yes, you may go ahead and translate it — thank you for asking! Of course every type is equal — we all have unique strengths as well as weaknesses, both of which I write about for INFJs. That’s the type I generally focus on as an INFJ writer because it’s what I’m most familiar with, but I always enjoy reading perspectives from other types. I’ve read articles similar to this for being friends with ISFJs, ENFPs and other types that I found very helpful. That’s part of what Myers-Briggs is about, right? understanding makes other people tick so we can form better connections based on mutual respect and appreciation. Another INFJ here. I think you hit all the important points when it comes to what we want and expect in a friendship. Depth, authenticity, patience, consistency. Yep! We basically want to see the real person behind the mask most people wear so we can feel comfortable exposing who we are. I think most INFJs have felt so out-of-place and misunderstood throughout their life that they feel hesitant to show all of who they are to the world. If I begin to let someone see bits and pieces of who I am and they continue wearing a mask, it won’t take me long to lose all interest. If I’m willing to be vulnerable, I need the other person to be able to do the same or else I’ll just feel like the friendship is not going to go into a deep enough level for me to feel connected. I’ve had this problem. With me, you can’t just come and go as you please. I will end up feeling rejected and unimportant and eventually withdraw. I try so hard to be forgiving and understanding if I like someone a lot, but if someone shows a pattern of being unreliable, I’ll get to a point where I can’t lower my standards anymore. It hurts too much to feel like I care more about the friendship than the other person does. Regarding the comment above, I don’t see how this blog post “enhances a very unhealthy stereotype”. I don’t know what unhealthy stereotype he/she is referring to, either. The author basically said INFJs need to feel safe to open up and crave deep, lasting relationships with authentic people. Sounds pretty healthy to me! I haven’t read all of the comments on here so I’m not sure if this has already been talked about, but do most INFJs tend to form friendships with people who have been abused in some way? I am an INFJ and I just recently realized from one friendship that I am currently dealing with that many of the people I have been drawn to are people who have been abused in some way. I don’t know if this is more of a personal gift like mercy or if it’s a part of our empathic personality, but regardless I’ve realized it happens to me a lot. And it’s not like the person immediately tells me they have been abused. I naturally begin to sense it and as our friendship develops they get to a point where they trust me enough to open up and tell me about it. It can be very draining when trying to cultivate authenticity because abused people tend to put up a lot of walls of shame and rejection, and as a result they can’t always give back to you the same love and care that you are giving to them. But I can’t pull myself away from them! (Not that I would want to. I’ve met some amazing people!) I am consistently drawn to making friendships with people who have suffered some type of abuse or harm and I don’t know if that is an INFJ thing or just a personal thing. You may be on to something there. I used to be good friends with an INFJ guy who came from an abusive childhood. He had all kinds of problems (paranoid, delusional, etc.) and certainly attracted other “wounded birds” like him (of course there were normal friends in the fold also). Unfortunately for him, his friends slowly disappeared one by one, because they couldn’t handle his intensity or intrusive nature. I witnessed his good side and his dark and unappealing side. The true definition of the dark side of INFJ. Frankly, I think intensive counseling would have done him a world of good. Do you think INFJ’s have the potential to go mad with power? I am an INTJ, but I’m attempting to be friends with an INFJ. As I’m usually a very guarded person, I am reluctant to show my inner self. However, I understand that INFJs require a deeper, more genuine relationship. Some of my attempts to be genuine have resulted in hurting my friends feelings. This is not speculation, for she told me so. How can I fulfil her needs for honesty without saying something that would offend? How honest should I be? Or is there a way I can temper my responses in a way she could appreciate? I’d say one of the ways you can fulfill her need for honesty is by telling her pretty much what you just told me. You can share with her that you want to be friends but it’s hard for you to open up. You might tell her you want to be honest without hurting her and that you’re trying to understand what kind of communication she values in a relationship. I’m pretty sure she’d appreciate that and it could easily lead to some other friendship-building conversations. My INTJ sister is one of my best friends, so I can say first-hand that INTJ-INFJ friendships can be wonderful (though communication issues are a continuing struggle for us). I hope this friendship works out for you! I’m an ENTP and I’ve an INFJ that I really want to be friend. But recently we have a quarrel and stop talking after that (about 3 weeks). Now, I just realize that I want him to be my friend and stop to talk and pretend like stranger to him is a fatal mistake. Do you think It’s too late for me to make up with him? Now, I think I figure out my mistake to him. I don’t think it’s too late. Try reaching out and telling him that you’d like to fix things between you and try to be friends. I don’t know your exact situation, but INFJs tend to appreciate honesty and if you tell him that you regret the quarrel and want to work on building a friendship I think there’s a good chance he’ll respond well. I hope things work out for you, Willow!